This little girl is awesome, just based on her overwhelmingly earnest love -- a love she feels immediately -- for a shelter dog with unusually bowed front legs. When she first saw her future pet, a chihuahua with an angular limb deformity named Rikki on the Animal Rescue League of Boston Facebook page, she was immediately smitten. Even dogs with abnormal limbs need love and the two have been inseparable since. 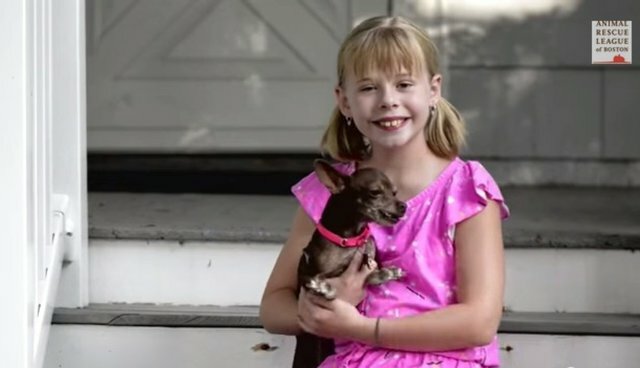 In this sweetly inspirational video, Rikki's young adopter explains what makes the chihuahua so special. It's a poignant reminder that all dogs (and all shelter animals for that matter) deserve to find loving forever homes.